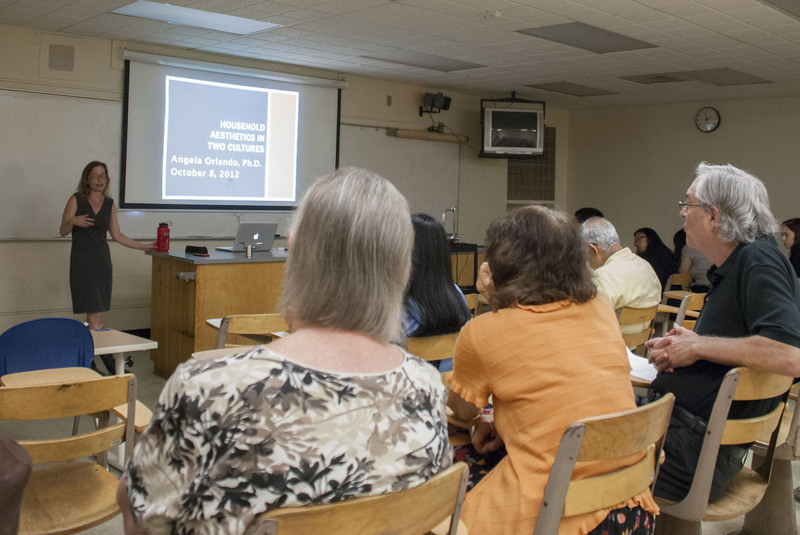 The Pierce Anthropology and Geography Department and Associated Students Organization (ASO) were proud to present guest lecturer Dr. Angela Orlando on Oct. 8, who discussed the aesthetics of household art in Los Angeles and Lima, Peru. Orlando, who teaches at West Los Angeles College, spoke of her 2006 trip to Peru, which at the time of her research was the fastest growing economy in the western hemisphere. She had previously studied in Peru during her senior year at the University of Arizona, and while there she noticed significant differences between the U.S. and Peru. “Here in the US we have completely different aesthetics than people in Peru,” Orlando said. In particular, the aesthetics inside U.S. and Peruvian households drew her attention. Orlando started looking at middle-class families in Lima and L.A. that were “living analogous lives,” she said. For Orlando, ordinary items such as family photos or fish tanks were art that could be a window into the culture of the household. Whatever a guest notices when they step into a house for the first time is what the family wants them to notice, she said. “We put art where we want to project about ourselves on a daily basis,” she said. In general, Orlando’s study found that Peruvian families preferred less cluttered homes with natural, bright spaces. L.A. families wanted spacious rooms but were less likely to actually have space. L.A. families also had a noticeable presence of children’s art, while Peruvian families proudly displayed indigenous art, according to Orlando. Every semester lectures, such as those by Orlando, are regularly presented by the Anthropology and Geography department. Graduate students as well as professors are invited to present their research and lecture, said Diane Levine, chair of Anthropology and Geography. Orlando hopes that students interested in anthropology will be able to take from her lecture that thinking outside the box pays off. “I hope students understand that anthropologists can ask questions about all aspects of people’s lives, use various and fun sorts of methods, and analyze data in interesting ways,” she said. At least two more anthropology lectures will be hosted by Pierce later during the semester, Levine said.